I haven’t seen that on the product roadmap but I think that to be very useful feature: ability to set tasks to repeat on schedule. To be honest, I know that in many tools there are either too simple and limited or too complicated to easily use. Hi @man, thank you for the suggestion and nicely defined functionality! Recurring item can be a very useful feature, we see a lot of use cases. It is a part of the Automation Features we’re planning to implement in the future stages of Infinity development. Automation is basically a ‘smart dashboard’ where you can configure triggers and set rules like IF something happens, DO something. Regarding recurring items, your suggestion on how it should work is completely valid. I think it’s a great suggestion. Do you have some use case at the moment to use this feature? I’ve added recurring tasks feature in our backlog. It’s not a priority at the moment since we still have a work to do regarding the core functionalities, but I hope it will be done by the end of the year. Or is there already something like this that I am missing? Yes, that would exactly be the case! +1 here. In order to implement company-wide, I would absolutely need to have a recurring task feature. Sometimes it is nice to have a new item created, but sometimes it might be enough to just remind the user to go back and look at the status of an item… I see this as super useful if reminders could be setup for unfinished task lists. Thank you for the message and suggestion. To best illustrate the mistakes other systems make, let’s consider Asana – arguably one of the most used project management systems today. Asana’s implementation of repeating (recurring) tasks is typical of most other systems and it is fundamentally flawed. In Asana, you can only ever see the next occurrence of the task, and the task does not repeat until after it is completed. if you have a daily task and you don’t complete Monday’s task until Wednesday, then you will only see Tuesday’s task on Wednesday and still nothing for Wednesday. future occurrences of the task do not show up in your calendar. there is no way to adjust one specific occurrence – for instance, if you have a monthly meeting that is typically the first Monday of the month, but one Monday happens to be a public holiday, then you would want to be able to shift that meeting to Tuesday in advance, but that is not possible. There is no way to add custom content or attachments to future tasks. 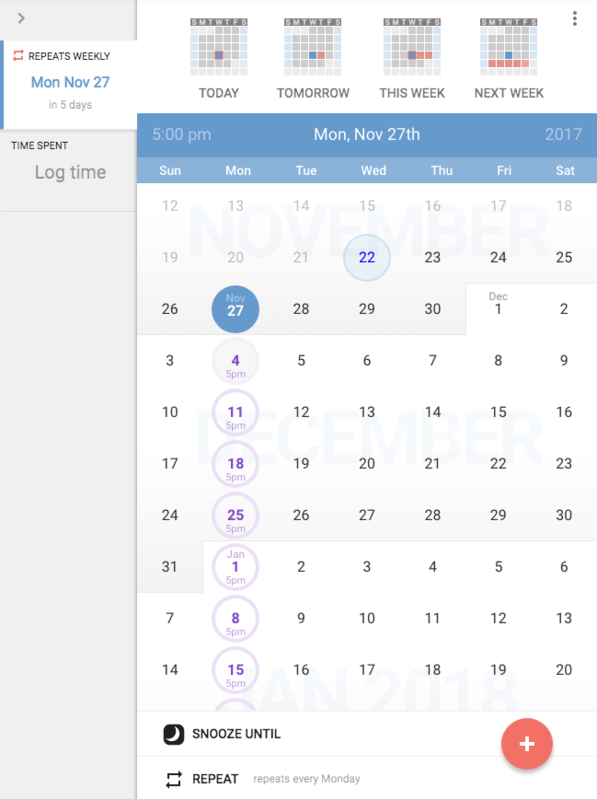 In todo.vu, repeating tasks are real tasks , they are editable and customisable and visible in calendars . Each occurrence is a real task that can be viewed, edited and customised in advance. Each future task occurrence shows up in your calendar and iCal sync feeds. Future tasks are snoozed so they do not clutter your to do list, but will automatically “wake up” at a predetermined interval before the task is due. Each task has independent workflow and will become ‘to do’ and ‘due’ independent of previous tasks. 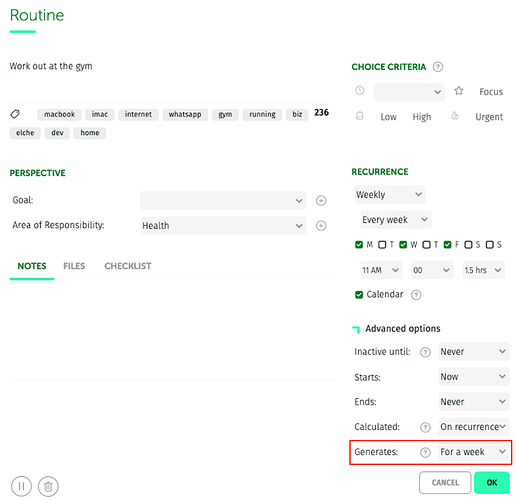 You can make tasks recur on any number of days, any sequence of weekdays, weeks, months or years and also “Nth weekday of the month” sequences. Most businesses have repeating tasks. Even if your primary client/project work does not repeat, you will surely have tax returns, license and insurance renewals, domain name renewals and other administrative tasks that regularly repeat. Being able to capture and schedule these into your task management system without cluttering your inbox is vital for a smooth functioning office. So when you are reviewing alternative systems – take a serious look at how they really work. Most implement a weak and almost useless version of recurring tasks in order to complete a checkbox on a functionality survey. But at todo.vu we have developed a genuine, robust and flexible solution to keep you and your business productive at all times. I think that this kind of approach is much better but I’d like to hear what other members have to say. any eta on recurring tasks? June this year would be the ETA. 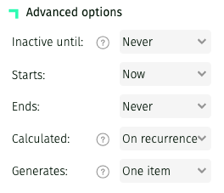 The advanced options allow modifying the way the dates are calculated and how the recurring actions are generated. Inactive until : Allows you to “hide” the action generated by the routine in the Tickler File until a few days before the scheduled day for its execution, so that it does not distract you when it is not yet necessary. Starts : Allows you to set a date from which the actions of the routine will begin to appear. The first action will appear on the first date equal or later than the one indicated that matches the specified recurrence. Ends : It allows you to indicate how long this routine should be generating actions. You can define a specific number of ocurrences, or an end date. Calculated . There are certain recurring events that, when delayed, must delay the next occurrence, such as “vaccinate the dog every three months.” If you delayed a couple of weeks the last vaccine, the next should one be three months after you put it on. For this class of actions, use the calculated on completion option. Generates . The usual thing is to generate only one recurring task, so that the Calendar does not get filled with tasks that can create distraction. However, sometimes, due to planning issues, it is interesting to simultaneously have all the occurrences of a routine for the next week in the Calendar, so you don’t miss any appointment. Usually, if you do not skip the Weekly Review, generating all the actions for a month will not be necessary. 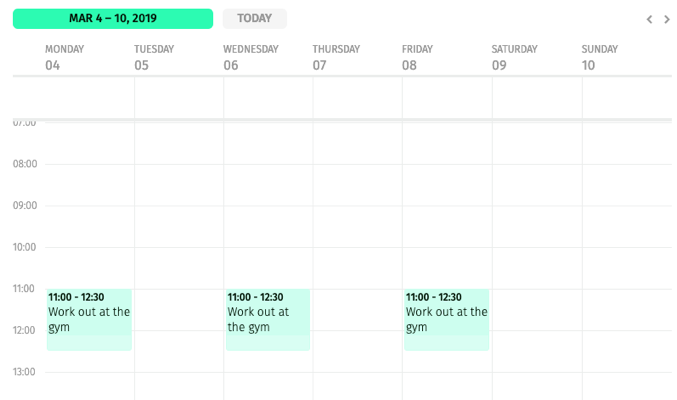 In some cases, due to planning issues, it’s interesting to simultaneously have all the occurrences of a routine for the next week in the Calendar, so you don’t miss any appointment. 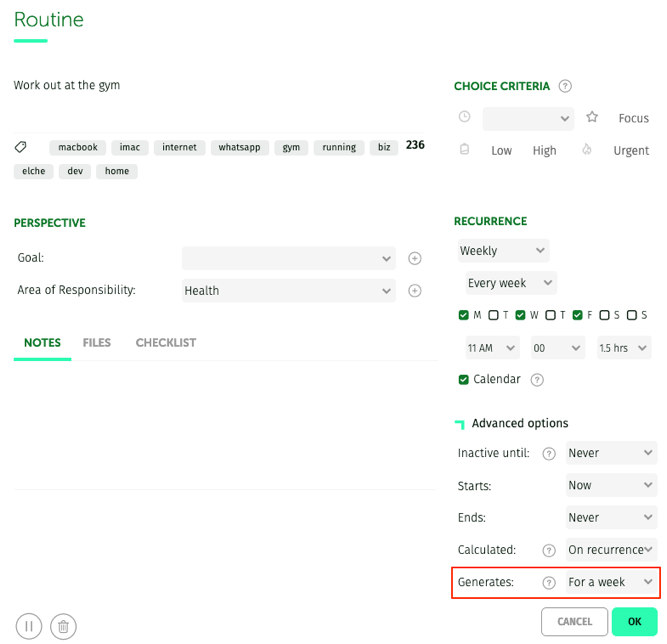 We have added a new advanced option in the Routines programming section that will allow you to generate all the recurring actions of a routine during a week or a month. This can only be done with routines whose actions go to the Calendar and have a daily or weekly frequency (it does not make sense for routines with a higher frequency). This option has three possible values: Generates one item, generates item for a week, generates items for a month. The recommendation is to always generate a single item, except for those events that you really need to take into account when consulting the Calendar during the week. 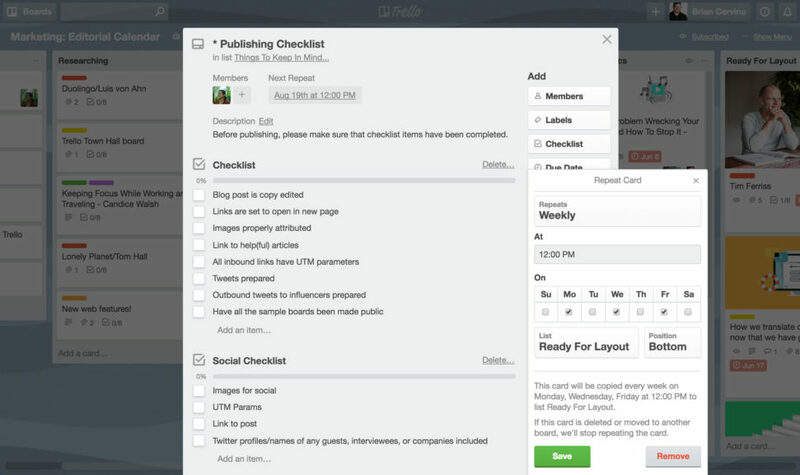 Normally, if you don’t skip the Weekly Review, generating all the actions for a month will not be necessary. Once you have generated all the recurring actions for a week or a month, there will always be the same number of actions of that routine in the Calendar. When you mark the first one on the list as done, a new action will be automatically added at the end, and so on. I badly need it, hope to have it in near future. Cards can be set for new copies to be created at any specified time: daily, weekly, monthly, or annually. No excuse now if you forget your mother’s birthday present. Repeated cards will include members, descriptions, checklists, etc. from the parent card, saving you even more time. Regularly Scheduled 1:1 Meetings: Managers and members of the HR team that hold regular 1:1 meetings, check-ins, and reviews can set up repeating cards to not only remind team members of an upcoming meeting, but also to have a place where people can list items to discuss during a meeting, or make note of any takeaways. End Of Month Bookkeeping Reminders: When it comes to closing out the books each month, finance and operations teams can have cards created with all of the steps required to make sure no money gets lost in the metaphorical sofa. Automating Repeating Reports : Speaking of money, sales teams that need to put together weekly, monthly, and annual sales reports can have those tasks added to their to-do list with the Google Sheets file already attached to the card. Regular Content Creation for Marketing: Marketing teams that send out regular newsletters or publish blog posts can have cards created with the content manager responsible for the newsletter already added to the card, and a checklist of everything that needs to get done to send a successful marketing email. IT teams that regularly enforce password changes can keep track of what passwords need to be updated, minimizing the risk of security breaches. I think this will be very useful for our devs.